You are here: Home / Sightseeing / Kiev Airport Transfer – Dopobachennya Kiev! DAY 12 Kiev. (Sun.) After breakfast, disembark and transfer to the airport for your flight home. We have to vacate our rooms by 09:00 a.m. so that they can clean the river boat for the next cruise, however you are able to wait in the Panorama Bar. A light lunch is also available for those who are not transferring to the airport first thing in the morning. If you’ve pre-booked your airport transfer with Viking, they’ll organize your airport transfer according to your flight times. We organized our own taxi transfer (same people who arranged our Odessa airport transfer). 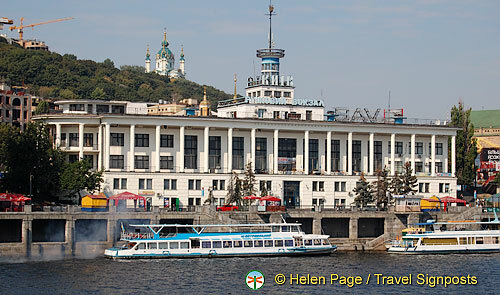 The Kiev Boat Terminal thankfully is right in the middle of town. All we have to do is walk up a set of steps to the car-parking area. Our pre-arranged taxi driver arrives on time, although the poor guy had quite a time getting into the area because of the road closures due to the previous day’s national celebrations. The taxi ride to the airport is about 40 minutes. The driver speaks only a smattering of English, but he is very polite and gets us to the airport in good time. Kiev Airport terminal is rather small for the amount of flights and passengers that go through it. You have to get there in good time as it’s not a very efficient place, however once you are there, there aren’t enough seats for people waiting for their flights so it is rather messy. We find a quiet window sill and sit there till our flight boarding time. The announcements aren’t too reliable so we have to keep checking the board for our flight to be listed. It is a relief when we finally board our plane.